Time to work on the long stretchers. The front stretcher has an inverted "V" track on the top front edge for the sliding deadman, so I'll sink a molding. 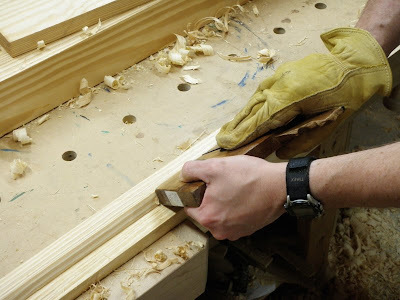 First step is to sink a rabbet in the back side of the top to lower the edge. Using a 1" skew rabbet plane. 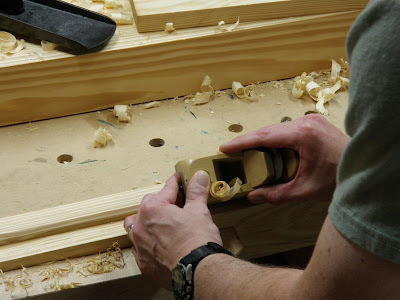 Since the rabbet is 1 1/4" wide, this takes two sinkings, bringing each one down near a depth of 1/2", then laying the plane on it's side and going the opposite direction to bring it down to the line. On the first sinking I used the rabbet plane too wide, nearly full width. It got to be heavy going, repeatedly loosening the blade. The second sinking, at only 1/4" wide, was much easier. I should have split it evenly, or maybe even done three sinkings. Multiple easy sinkings are definitely easier than a single heavy one, and probably end up being faster. The glove makes handling a molding plane easier for real work, since each sinking requires a number of strokes with the plane. Second step is to make the chamfer over the rabbet. I started with the block plane, until it got down to the point where it was too wide for the blade on this inside corner. Using the rabbet plane on the spring. This eventually got too wide, again resulting in heavy going for this plane. 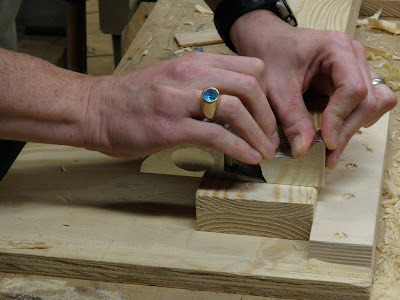 Finishing up with the shoulder plane, since it could fit all the way into this corner. This ended up working very well, producing a nice fine ribbon nearly the length of the stretcher. This is the most success I've had with this shoulder plane. The final profile after chamfering the front edge with the block plane. 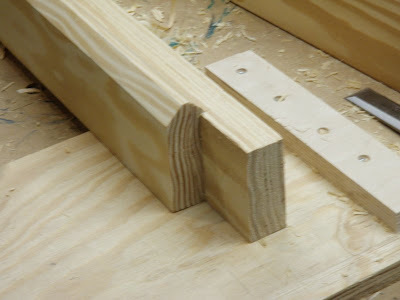 After molding the edge, the ends need to be tenoned. 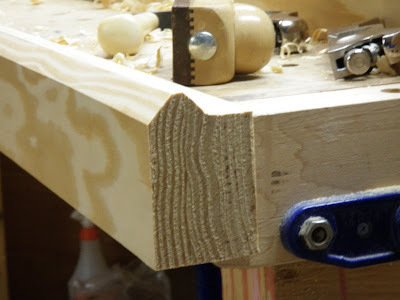 I did this with my fine-toothed Lie Nielsen tenon and dovetail backsaws, but these turned out to be inappropriate tools here. 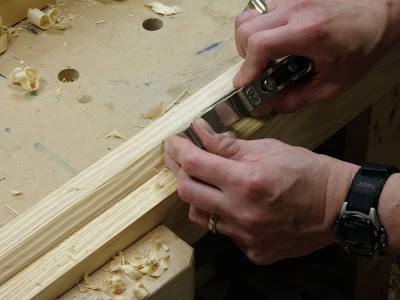 The tenons are too big and the wood too soft, resulting in a lot of cleanup work. 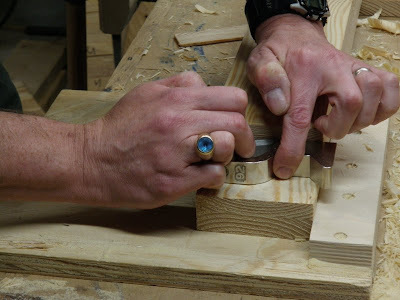 Cleaning up the cheek with the shoulder plane. This operation was the most troublesome for me. I haven't had a lot of success with this small shoulder plane. 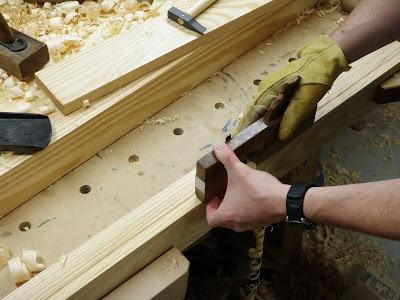 It makes me lust for one of the big Lie Nielsen shoulder planes that have the mass to carry them through the cut, as well as the size to grip it well without bumping my hands into the wood.